A significant portion of my readership was likely concerned for my safety. Like clockwork, I have posted YPP and APR recaps of each FBS conference every Thursday. However, this week in honor of the Final Four I want to do something a little different. Don’t worry, we’ll pick back up with the MAC APR next Thursday and continue unabated through the remainder of the FBS conferences. Last year over this same weekend, I wrote that conference expansion (driven primarily by football) has been making March less mad. That trend continued in the 2017-2018 season. Shortly after that post, Wichita State officially joined the American Athletic Conference further consolidating power into eight conferences (ACC, American, Atlantic 10, Big East, Big 10, Big 12, Pac-12, and SEC). Those eight leagues each sent multiple representatives to the 2018 NCAA tournament and accounted for all of the at-large bids save one. Teams like Saint Mary’s and Middle Tennessee State were passed over in favor of teams from those eight conferences like Syracuse and Arizona State. Of course, St Mary’s and Middle Tennessee were not perfect at-large candidates, especially considering St Mary’s non-conference schedule and Middle Tennessee’s stumbles to close the season, but it was indicative of a disappointing (in my opinion anyway) trend. Read that previous post for a full numerical analysis of recent at-large bids. But I digress. That lone additional bid went to Nevada of the Mountain West Conference. And speaking of the Mountain West, rumors are presently swirling the league will add Gonzaga from the West Coast Conference. The move would be great for Gonzaga and the Mountain West, but it would make garnering an at-large bid for other West Coast Conference teams (like St Mary’s) infinitely more difficult. Anyway, I don’t have a whole lot more to say about mid-major teams getting at-large bids. Nothing much has changed since last season. However, I still wanted to do a numbers based basketball post. A few weeks ago, I was listening to sports talk radio and somehow the name Fran McCaffery came up. I remembered McCaffery from his time at Siena in the late 00’s. I did not remember him at all from his time at UNCG and Lehigh prior to that. I knew he was at Iowa and I reckoned he had probably been there close to a decade. I remembered seeing Iowa in my NCAA tournament bracket a few times and thought McCaffery had done a decent job at Iowa. Has he? Iowa has made three NCAA tournament appearances (three straight from 2014-2016) in his eight season at the helm. Is this good? Or, more accurately I suppose, does this qualify as success at Iowa? Does making the tournament not quite half the time qualify as success? Obviously, McCaffery would have been run out of town were he the coach at Duke, Kansas, Kentucky or some other literal or figurative blueblood program. At Iowa though, that seems like a decent track record. Looking at McCaffery’s record made me wonder what would be considered ‘success’ at every major conference school? 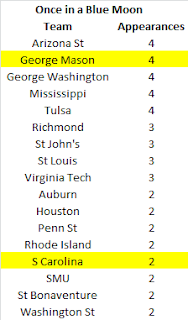 Since those eight conferences I mentioned in the previous paragraph account for pretty much all the at-large bids nowadays, I decided to calculate the total number of NCAA tournament appearances for each program in those eight conferences (Super Eight?) and divide them into tiers based on how often they qualified for the NCAA tournament. Fans and aspiring athletic directors can use this data to determine if it might be time to make a change at the top. Before we dive into the results, here a few housekeeping notes. 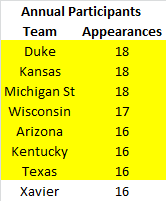 I looked at all NCAA tournament appearances since 2001. The 2001 season provides a nice arbitrary starting point since that is the year the NCAA instituted the (don’t call it a) play-in game pitting the lowest rated automatic qualifiers to determine who would advance to the main bracket as the final 16 seed. A decade later, the tournament again expanded, adding three additional play-in games and dubbing them the ‘First Four’. Going back to 2001 gives us a large cross-section of data (18 seasons), but keeps us grounded in relatively recent history. There are 101 teams in those eight conferences. Fastidious readers will notice I have only included 99 of them in the following tables. As conference membership has been quite volatile since 2001, I included any current member of a Super Eight conference as long as they were a member of a conference in the past that could at least conceivably receive an at-large bid. Thus, the only teams that were eliminated were UCF, which spent time in the low-major Atlantic Sun during this time period, and Davidson, which was a long-time member of the Southern Conference. The Southern Conference certainly has a great history, but the league has never produced an at-large NCAA tournament team. Using these criteria, UCF and Davidson are excluded, but a school like East Carolina, which has not had any recent success on the basketball court, but did play in the CAA and Conference USA before joining the American is included. If you are mad about that, well, you probably don’t have a lot to be mad about in your life, so I envy you. Finally, I included total tournament appearances and not percentage of times making the tournament. If a team was ineligible for the tournament, those extenuating circumstances did not factor into the results listed here. If you are disappointed with that decision, I recommend your team either stop cheating or start cheating better. Anyway, with this long intro out of the way, let’s start with a list of teams that are main stays in the NCAA tournament. 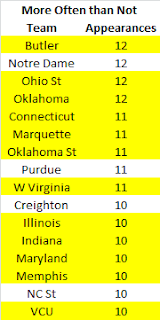 Teams highlighted in yellow (in each table) have appeared in at least one Final Four. Duke, Kansas, and Michigan State. Those are the only three major conference teams (I see you waving frantically Gonzaga) to have appeared in every single NCAA tournament since 2001. If I had compiled the data before this season, Wisconsin would have joined them, but the Badgers missed out on the tournament for the first time since 1998. The other mainstays include one surprise (at least to me). Xavier has been a consistent NCAA tournament force this century despite losing four coaches to ‘better’ jobs. Going back even further, their last six coaches all won enough at Xavier to merit jobs at ‘better’ locales. Has Xavier been that good at nailing their hires or is there something in the university’s culture and infrastructure that allows them to continuously put good basketball teams on the floor regardless of the man in charge? These next few teams have been consistent NCAA tournament participants, missing a tournament here or there, but for the most part you can expect them to appear on Selection Sunday. It’s funny a team that just finished up a winless conference season appears as a consistent NCAA tournament team, but the Pitt Panthers have a solid history this century. 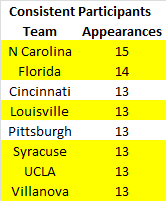 This list has a vintage Big East flavor, with five teams (Cincinnati, Louisville, Pittsburgh, Syracuse, and Villanova) spending significant portions of their time in that conference. These teams miss a tournament here or there, but more often than not, they wind up in the Big Dance. To me, the most interesting team on this list is Connecticut. The Huskies have participated in eleven tournaments since 2001, or exactly one more than Creighton, but they have made the most of their appearances. They have won three championships (2004, 2011, and 2014) and have another Final Four appearance (2009). Along with Maryland (2002), they are the only team in the third tier or lower to win a national title since 2001. Now we come to your ‘average’ major conference team. These teams make the tournament about half the time. Unlike the previous three tiers, there are not a lot of Final Four participants to be found here. Whereas over 78% (25 out of 32) of the teams in Tiers 1-3 had played in a Final Four, just a quarter of the teams in Tier 4 have made it to a national semifinal. This next group of teams sometimes makes the tournament. Casual fans know they have a basketball team, but probably don’t give them much thought. The impetus for this exercise, Fran McCaffery’s Iowa team, appears on this list. I would say McCaffery has slightly exceeded expectations based on Iowa’s recent history, but he’s no Tom Davis. Remember when Georgia Tech made a run to the national title game? Me neither, but it did buy Paul Hewitt seven more years in Atlanta. That’s more time than a deep tourney run bought John Brady though. He was out of a job less than two years after leading LSU to the Final Four in 2006. These schools make sporadic appearances in the NCAA tournament, but you would probably be surprised to see them in your bracket. Most of the teams on this list are either football schools (or schools that typically invest more in football) or members of the Atlantic 10. Finally we come to the chaffiest of the chaff. These teams have made at most one appearance in the last 18 tournaments. Thankfully Ray Meyer and George Mikan are not around to see how much the DePaul program has imploded. The Blue Demons along with other woebegone programs in major cities like Northwestern, TCU, Fordham, and Rutgers have failed to utilize their proximity to elite talent in building their basketball programs. There is evidence that some of the teams on this list are at least trying now. TCU just made their first NCAA tournament appearance in two decades, Northwestern made their first ever appearance last season, and Tulane has a former NBA coach on the bench (though he might be past his sell by date). So there you have it. You can tell a lot about your team by the company they keep. Which tier does your college basketball program fall under? Is the new coach pushing your team into another tier or is he dragging them down? Or do you not even know the basketball coach’s name? These tiers can serve as a starting point to determine if your coach is meeting expectations. We’ll return to our regularly scheduled programming next week. Thanks for reading. Hard to believe, but we are now halfway through our conference recaps. Next up is the MAC. Here are the 2017 MAC standings. So we know what each team achieved, but how did they perform? 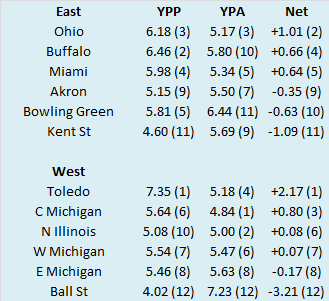 To answer that, here are the Yards Per Play (YPP), Yards Per Play Allowed (YPA) and Net Yards Per Play (Net) numbers for each MAC team. This includes conference play only, championship game excluded. 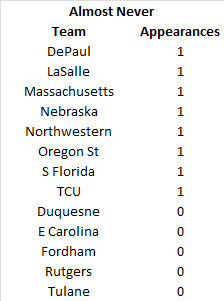 The teams are sorted by division by Net YPP with conference rank in parentheses. College football teams play either eight or nine conference games. Consequently, their record in such a small sample may not be indicative of their quality of play. A few fortuitous bounces here or there can be the difference between another ho-hum campaign or a special season. Randomness and other factors outside of our perception play a role in determining the standings. It would be fantastic if college football teams played 100 or even 1000 games. Then we could have a better idea about which teams were really the best. Alas, players would miss too much class time, their bodies would be battered beyond recognition, and I would never leave the couch. As it is, we have to make do with the handful of games teams do play. In those games, we can learn a lot from a team’s YPP. Since 2005, I have collected YPP data for every conference. I use conference games only because teams play such divergent non-conference schedules and the teams within a conference tend to be of similar quality. By running a regression analysis between a team’s Net YPP (the difference between their Yards Per Play and Yards Per Play Allowed) and their conference winning percentage, we can see if Net YPP is a decent predictor of a team’s record. Spoiler alert. It is. For the statistically inclined, the correlation coefficient between a team’s Net YPP in conference play and their conference record is around .66. 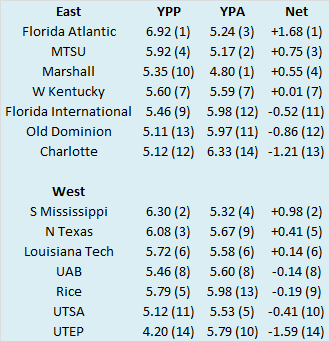 Since Net YPP is a solid predictor of a team’s conference record, we can use it to identify which teams had a significant disparity between their conference record as predicted by Net YPP and their actual conference record. I used a difference of .200 between predicted and actual winning percentage as the threshold for ‘significant’. Why .200? It is a little arbitrary, but .200 corresponds to a difference of 1.6 games over an eight game conference schedule and 1.8 games over a nine game one. Over or under-performing by more than a game and a half in a small sample seems significant to me. In the 2017 season, which teams in the MAC met this threshold? 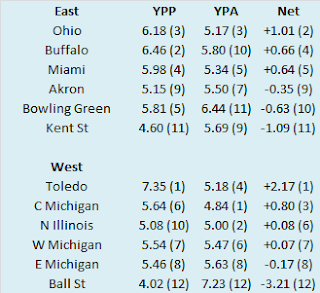 Here are MAC teams sorted by performance over what would be expected from their Net YPP numbers. 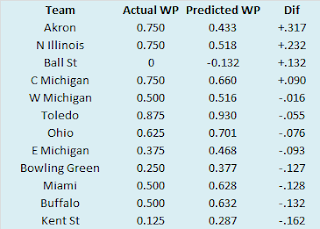 No MAC teams significantly under-performed relative to their YPP numbers, but Akron and Northern Illinois finished a little higher in the standings that we might otherwise expect. The Zips and Huskies combined to finish 6-1 in one-score conference games, with Akron finishing 3-0 in such contests, including a pair of one-point wins and a three-point win against Ohio that ultimately gave them the division title. Both teams also scored in unconventional ways, as they combined to score seven more non-offensive touchdowns in MAC play than they allowed. Northern Illinois finished +4 (scored five and allowed one) while the Zips finished +3 (three scored and none allowed). Finally, Akron led the MAC in in-conference turnover margin (+10) on their way to their first division title since 2005. Speaking of division titles, you may have noticed Akron won the MAC East despite being ‘underwater’ in terms on their Net YPP. How often do teams with negative per play differentials win their divisions? I’m glad you asked. I have YPP data back to 2005, so I fired up the Excel spreadsheet and perused the data to find out. 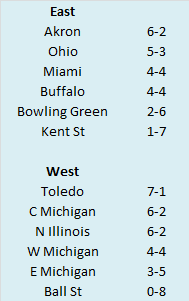 Since 2005, there have been seven such instances (including Akron in 2017) of mid-major teams finishing with negative in-conference YPP numbers and winning their division. They are listed chronologically in the table below. There was a bit of a hiatus following the 2008 season, but since 2014, an average of one mid-major division champion per season has finished with a negative per play differential. 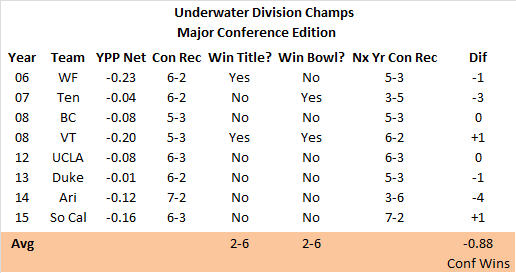 As we might expect, those underwater division champs have seen their luck run out in the conference championship games. Buffalo and East Carolina in 2008 are the only teams to win their respective conference championships. This cohort has also performed quite poorly in their bowls games, winning just once in seven games. And finally, the teams tend to decline the next season, although there are some notable exceptions in East Carolina and Bowling Green. The Pirates repeated as Conference USA champions in 2009 while Bowling Green improved dramatically in their second season under Dino Babers en route to a MAC title in 2015. However, despite those examples of improvement, I would expect the Zips to perform closer to the average underwater division champ and experience at least a modest decline in 2018. 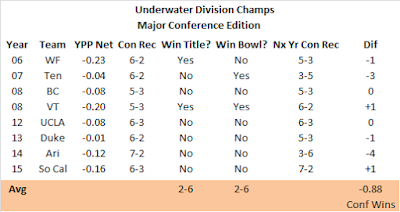 To satisfy my own curiosity, I decided to look at major conference (BCS and Power Five) division winners that finished underwater. Surprisingly, since 2005, there were actually more division champs from major conferences that finished with negative in-conference YPP differentials. I figured the more egalitarian nature of mid-major conferences would produce more underwater division winners, but at least in this thirteen year sample, that did not occur. And interestingly, none of the underwater division champs got that way via technicality. I figured UCLA in 2011 or Georgia Tech in 2012, winners due to postseason bans of their division mates, would be on this list, but they actually posted positive Net YPP numbers. Once again, the underwater division winners do not have a good record in conference title games. My alma mater closed the deal in 2006 and the 2008 ACC Championship Game pitted two underwater teams, so one of them had to prevail, but overall the division winners are 2-6 in title games and 2-6 in bowl games. 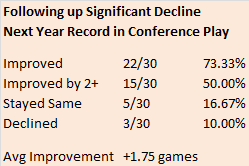 The major conference division winners did not decline as much as their mid-major counterparts on average the next season, but we are dealing with a pretty small sample size here, so I wouldn’t draw any major conclusions from that. I’ll keep my fingers crossed for an underwater major conference division champ in 2018. Once again, here are the 2017 Conference USA standings. 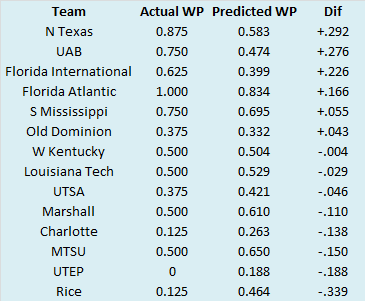 Finally, Conference USA teams are sorted by the difference between their actual number of wins and their expected number of wins according to APR. I use a game and a half as a line of demarcation to determine if teams drastically over or under perform their APR. 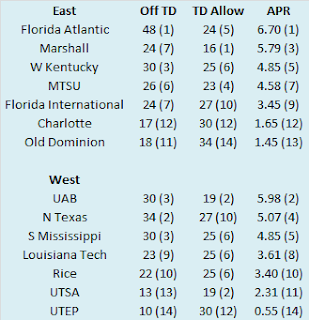 By that standard three teams (North Texas, Florida International, and Old Dominion) exceeded their expected record and two (Marshall and Rice) finished with fewer wins than we would expect given their APR. 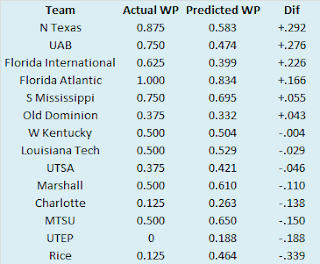 North Texas and Florida International also finished with more wins than we might expect based on YPP and we discussed why last week. What about Old Dominion? How did they exceed their expected record? Old Dominion posted a decent record in close conference games, winning three of five, but the Monarchs finished with a poor APR because they were blown out often. The Monarchs lost three conference games by at least thirty points. Consistently finishing on the wrong end of blowouts typically indicates a team is not very good (groundbreaking analysis) and the Monarchs were no stranger to that in 2017. On the other side of things, Rice also finished with fewer wins than we would expect based on YPP and we discussed some reasons for that last week. But why did Marshall underperform? The Thundering Herd finished 1-3 in close conference games, with their last two losses coming by a combined three points. They also finished second to last in the league with an in-conference turnover margin of -6. Switch a few plays here and there, and the Herd finish with double-digit wins. Last week, we talked about teams that improved significantly, and what to expect from them moving forward. 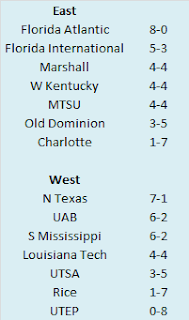 Conference USA had the distinction of featuring two teams that won at least four more conference games in 2017 than they had in 2016. The conference was also home to a team that lost four more conference games in 2017 than it did in 2016. Old Dominion finished the 2016 season with a 7-1 conference record. Their head-to-head loss to Western Kentucky meant they were denied a shot at the conference title, but this was still a phenomenal season for a team that did not exist a decade ago. In 2017, the Monarchs finished just 3-5 on Conference USA. Which result are we more likely to see in 2018? Are the Monarchs likely to bounce back or should Old Dominion fans get used to finishing with more losses than wins? To answer that question, I examined every mid-major (non BCS or Group of Five) team that lost at least four additional conference games than they had the previous season since 2005. 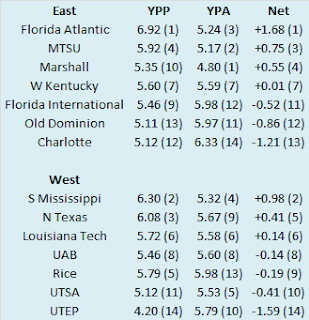 This query yielded 30 teams, not including the four that experienced this regression in 2017 (in addition to Old Dominion, New Mexico, Tulsa, and Western Michigan also lost at least four more conference games in 2017 than they had in 2016). How did those 30 teams perform the following season? The results are summarized below. 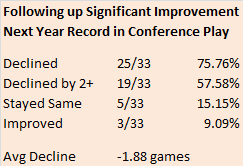 More than 70% of those teams saw their conference record improve the following season and exactly half improved their conference record by at least two games. 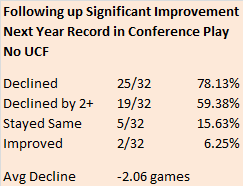 Only ten percent saw their conference record further erode and about 17% finished with the same conference record. Overall, the average team improved by 1.75 conference wins. 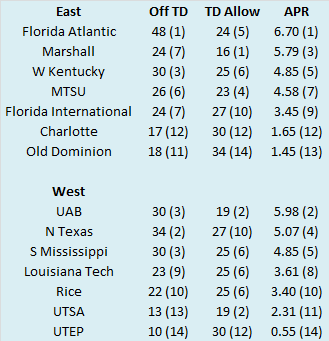 Old Dominion did outperform their APR by over one and a half wins in 2017, which typically portends regression the following season. Their large number of blowout losses (including non-conference games, the Monarchs lost five times by at least thirty points) also concerns me when projecting their 2018 record. However, as evidenced by similar mid-major squads that suffered dramatic one-year declines, improvement is hardly out of the question. The Monarchs have a quality head coach and dealt with a host of injuries last season. I wouldn’t expect another co-division title, but a return to postseason play is certainly within reach. Once again, here are the 2017 Big 12 standings. 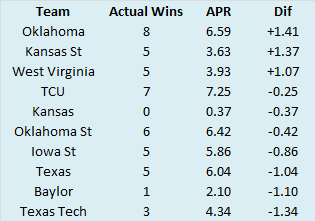 Finally, Big 12 teams are sorted by the difference between their actual number of wins and their expected number of wins according to APR. I use a game and a half as a line of demarcation to determine if teams drastically over or under perform their APR. 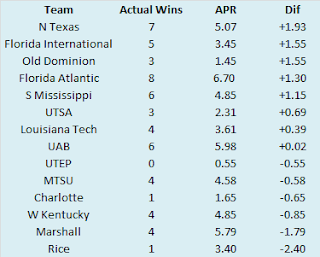 By that standard no team drastically over or under-performed relative to their APR. 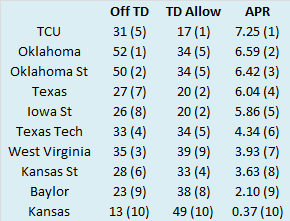 Since we don't have anything interesting to talk about here, let's talk about one of the most interesting teams in the Big 12: Kansas. For anyone who has followed Kansas football the last few seasons, let me start by offering my heartfelt apologies. Since 2010, Kansas football has been a dumpster fire. While the basketball team just won their fourteenth consecutive Big 12 title, the football team has managed a grand total of four conference wins in that span! Some might argue Kansas has been atrocious since 2009, and while its true the Jayhawks won just a single conference game in 2009, that team was at least competitive. The 2009 Kansas team actually scored more points (353) than they allowed (341) and were unlucky to finish with just one conference win, losing three games by a touchdown or less. The Jayhawks ended the year on a seven-game losing streak. This made it much easier to fire their successful, player-abusing coach. Since Mark Mangino’s departure, the program has cratered. Kansas has now won three or fewer games for eight consecutive seasons. This got me to thinking, how does Kansas stack up with other woeful power conference teams? Are the Jayhawks currently in the midst of one of the worst runs in recent college football history or do they have company in the gutter? To answer that question, first I needed to identify a reasonable time period to examine. College football has been played for a long time, but the game looked pretty different in the early 1900s, so comparing Kansas to the 1901 Bowdoin Polar Bears doesn’t provide much value. However, in 1984 a pretty significant event occurred that revolutionized college football. The SCOTUS ruled that individual conferences and schools could negotiate their own television deals. Using this watershed moment as a clear delineation, we’ll define post-1984 as the ‘modern era’ of college football. 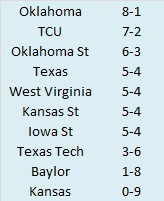 So, with three and a half decades of history, I looked at power conference teams (this includes the current Power 5 and former BCS conferences as well as those teams in the old Southwest Conference prior to the formation of the Big 12) that won three or fewer games in at least six consecutive seasons with a negative SRS score. SRS measures how many points a team is above or below average and ensures that our query captures teams that were truly bad, and not those that were simply unlucky. In addition to Kansas, five other teams met these criteria. They are listed below. The good news for Kansas is that most of these teams experienced at least a modicum of success shortly after their sojourn through the wilderness. Baylor almost qualified for a bowl game in 2005, hired Art Briles a few years later, and reached unfathomable heights (with no off field troubles whatsoever). Iowa State saw outstanding individual achievement even in the core of their struggles. It took Dan McCarney a few years to find traction, but the Cyclones played in five bowls in six seasons between 2000 and 2005. During their miserable run in the 80’s Kansas State hired the best coach in college football history and nearly played for the national title in 1998. After a brief retirement, The Wizard is still in Manhattan working miracles. Northwestern played in the Rose Bowl in 1995 and have been annual bowl contenders since. It took Temple longer than the other four teams to reach respectability, but even after they were booted from the Big East, the Owls managed to play in a bowl game within a decade and even won their conference in 2016. Yes Kansas fans, things may look bleak now, but climbing out of the muck can happen quicker than you might expect. Of course, the Jayhawks have produced their worst SRS scores in their current run of inefficacy under head coach David Beatty, so he may not be the man to coach the next bowl bound Jayhawk team. One thing that surprised me when gathering this data was the teams that did not appear on this list. I figured ACC punching bags Wake Forest and Duke as well as SEC bottom dweller Vanderbilt would meet the criteria for inclusion. While all have fielded bad teams since the mid-80’s, they have always managed to intersperse those years of futility with moments of competency.